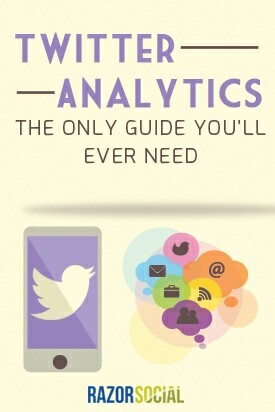 Looking for a reference guide that will give you information on everything you need to know about Twitter analytics? When was the last time you analyzed your tweets to figure out what works and what doesn’t work? When was the last time you analyzed your audience to make sure you are attracting the right people? What happens when traffic from Twitter arrives to your website? What actions do they take? No time to read this article now? Download the PDF version for future reference! 1. Audience Engagement: Is your audience interacting with your content? If you are sharing content, you want your audience to favorite it, retweet it, reply to it, click on a link, watch it (you can embed videos) etc. If they are not engaging with your content then you either have the wrong content or the wrong audience. When engagement is going up, you can then start drilling down to figure out what type of content is helping with this. What type of engagement do you want? If you get people to your site then you can get them to take action. Replies – People are looking to engage with you. You share something interesting and they reply. Mentions – This is an endorsement of your brand and/or content. As more people mention you, there is natural amplification of your brand without you being involved, which is great! A lot more people will see mentions than replies! Favorites – By clicking on a favorite button, people engage with your content but it’s a light form of engagement. If you look at the tweet, you can see it was favorited, but content is not shared to more people because of this. Not everyone wants to comment on your tweets but favorites still gives an indicator that they like your content. 2. Tweet Impressions:How many people have seen your tweets? Impressions are when someone gets to see your tweet. They may not have interacted with it, but they got a chance to see it. I know that engagement is much more important but, if people don’t get a chance to see your tweet, then they can’t engage with it! When you view impressions, you may start spotting trends such as higher impressions at certain times of the day. That doesn’t mean to say that you don’t schedule tweets when there are low impressions, because this may attract an audience you won’t reach at another part of the day. How can you get engagement on Twitter if you don’t get high impressions? But… you may want to send more tweets at the time when there are higher impressions. 3. Audience Profile: Do you have a relevant audience? b) Have a relevant audience for your content. When they share your content, you want some of their audience to be interested enough to check you out! c) Are influential. Not all of your followers are going to be influential, but you’ll want to target a group of influential users who will help amplify your content. d) Are customers, subscribers etc – When you already have a relationship with a community on other platforms, you need to convince them to follow you to Twitter or other places. These are people who have already shown an interest in your content. 4. Audience Size and Potential Reach: What is your follower count and potential reach? It’s not all about followers but, if you are attracting a relevant audience and they are engaging with your content, then of course you will want more followers! Are they trending upwards? What is the predicted growth levels based on current trends? How can you escalate this even quicker, to get better reach? It’s great to see your follower count going up but, if they all have 10 followers each, then it’s not much value to you. So, you’ll also want to look at the total follower count of each of your followers and divide that by the number of followers to get the average number of followers per follower! 5. 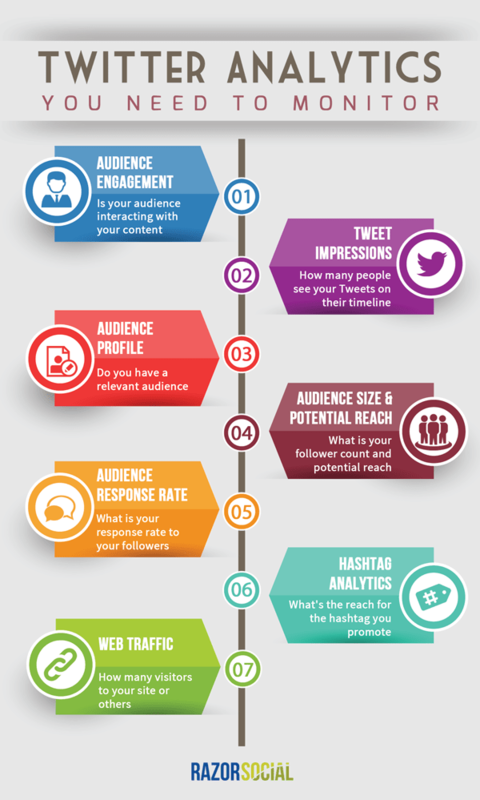 Audience Response Rate: What is your response rate to your followers? You may also want to monitor how responsive you are to your followers. If they are engaging with you and you’re not engaging back, you’ll reduce engagement from them and they could lose interest. To measure response rate, you could add up all the replies you send and divide it by the total mentions minus retweets. A retweet will include a mention but that’s not a reply! 6. Hashtag Analytics: What’s the reach of the hashtag you promote? You may want to track analytics related to a specific hashtag. a) Campaign – Imagine if you implemented a campaign to promote a conference. You can use one of the hashtag-tracking tools to find out the number of people mentioned/reached using this hashtag. b) Twitter chat – Twitter chats are conversations around a particular topic at a predefined time using a hashtag. You may want to track the reach of a Twitter chat you are a guest on, or the reach of a Twitter chat you are hosting. Here’s an example of a Twitter chat from Postplanner called ‘Viralchat’. As Brian was a guest, he was promoting this to his audience, which helps to bring in a new audience to the Twitter chat. If people click on a link and arrive on your website, this is free traffic that you can convert. When you do generate traffic to your own website what happens that traffic? Do they leave pretty soon after arriving or do they stay around and buy your products/services or sign up to your email list? You may be taking people from Twitter to a blog post. On the blog post, you might have an ’email subscribe’ option so you can track visitors who arrive from Twitter to become email subscribers. …or you may have a landing page that gets people to download a freebie or even buy a product. This is only relevant if you’ve got a mobile app and you’re using Twitter to allow people to download it. Twitter implemented Twitter Cards a couple of years ago, which expands on the information displayed within a tweet. The App Card allows you to have a ‘download now’ button to allow people to download your app, so you’ll want to track this. Twitter provides a Twitter analytics dashboard within the platform, which provides useful data. Action: Read this post on Twitter analytics. All reports are really nicely designed and the data is exportable to Excel. The following is an example of the report you can get, showing you the level of Twitter engagement, reach and actions from the tweets you have sent. Price: Starting price is $500 per month. Export all content for further analysis. Price: Starts at $129 per month with 14-day trial on all packages. RivalIQ is a competitive landscape tool. You set up all the competitors you want to track and then monitor your analytics in relation to your competitors. Compare activity – how many tweets everyone is sending on a daily basis? Mentions – the volume of mentions and who is doing the mentioning! Price: Starts at $199 per month. Locowise provides simple-to-understand graphical reporting that shows you how you are doing. Price: Starts at $120 per month. Price: Basic free report, then price starts at $45 per report or $245 per monthly report. Copy followers – You enter in the name of a competitor and it will show you the more active followers for the competitor. Keyword follow – Enter in a keywords and it will come back with a list of relevant accounts to follow. There is a good free version and price starts at $10 per month. Now that you’ve done all your analytics, it’s time to improve your results. To build followers, you need to provide great content and engage with your existing followers. … to build followers quickly, you need to actively go out and find them. One of the best ways to do this is to sign up to ManageFlitter and use the Power mode. This allows you to run advanced filters on ManageFlitter to identify the most relevant people to follow. Then, you hand the task over to the ManageFlitter team to follow a group of these people on a daily basis. They have a good follower/following ratio. Set and forget. You can even save the filter. You can’t follow thousands of people every day, so you specify a much lower number and ManageFlitter will follow these every day. You can also unfollow people who are not following you back. Price: You need a Pro or Business ManageFlitter account, then the price of the manual following of users is $5 per 1000 actions. 2. Share more content that works! When you go through your analytics, you’ll find that certain types of content works better than other types. Do more of this! Have a look at how this content is structured. Are you asking a question? Do you spark curiosity? Did you have good images? For example, we increased engagement by over 50% by making sure that the majority of our tweets have images associated with them, and we improved the text of our updates. A lot of our updates are blog posts and just taking the lazy approach and using the title of the post doesn’t work as well as posing a more interesting question. a) Analyze the audience to make sure you know what they want – Sharing the content they want is going to work better! b) Share compelling images – they also tried sharing animated GIFs and that worked really well. c) Refine your copy over and over again – we found this to be extremely important. What’s going to catch people’s attention? You need to come up with something compelling. d) Double down on content that works – use your analytics! e) Show a little personality – Hootsuite found that a bit of sass/humor in the copy worked well. Twitter Cards are additional information you provide to Twitter when you or someone else shares content from your website or other websites. a) Someone shares your blog post – instead of just sharing the title, you can tell Twitter about the image you have, include a description of the post etc. This means that a lot more space is taken up in a Twitter listing so it’s more likely that people will see it. b) You upload your presentation to SlideShare. SlideShare has Twitter cards enabled so people can browse through the slides directly within the tweet. Action: Read this post on Twitter Cards. 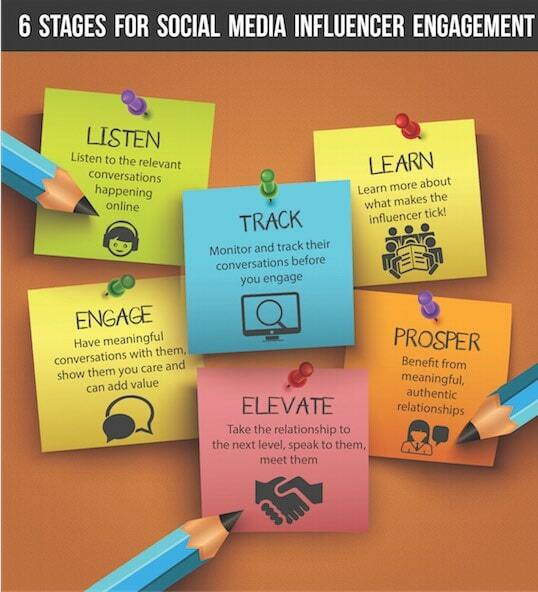 Your influencer friends will help spread your content to a new audience and also expand your audience. You need to think about how to build relationships, long term. You can look for people to connect with, using one of the tools above, or you can use a tool such as Klear, which categorizes people on Twitter into over 40,000 categories. So, you need a process and a tool. Action: Read this post to understand the process. a) Twitter chats – we mentioned running a Twitter chat or engaging with existing Twitter chats. Both help to increase followers, reach and engagement. If Twitter is an important platform for you then it’s hard to avoid Twitter chats! b) Hashtags – use hashtags selectively in tweets to help increase their reach. One of the best ways of using hashtags is when you are at a conference, or when a conference is on and you are not attending! Include the conference’s hashtag and provide relevant information to the attendees of the conference. c) Use a marketing automation platform designed for Twitter that allows you to automate tweets. If you are very careful about how you target and space out your messages, it can increase engagement and traffic to your website. One of the platforms that supports this is Insightpool. This strategy was deployed by Jay Baer and his team and they got very good results. Twitter is very time consuming. If you are spending time on it, you need to get results. The best way of getting results is through analytics. We quite often ignore analytics but that is certainly not wise. What are you going to implement from this article? It took us a long time to put this article together so I’d love to get some feedback.